A possible cause of heel pain is a heel spur, a bony growth under the heel bone. There are no visible features on the heel, but a deep painful spot can be found in or around the middle of the sole of the heel (see diagram). A large percentage of the population have heel spurs without any pain. Both heel pain is most often caused by an inflammation of the long band of tissue that connects the heel and the ball of the foot. 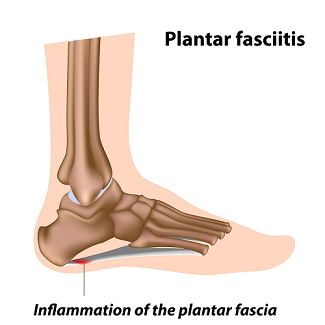 The inflammation of this arch area is called plantar fasciitis. The inflammation may be aggravated by shoes that lack appropriate support and also by a variety of lifestyle factors. It is a very common issue. The longer this problem exists the longer it can take to resolve. An inflamed bursa (bursitis), a small, irritated sack of fluid at the back of the heel. Heel bumps or "pump bumps", a bone enlargement at the back of the heel bone. Bruises or stress fractures to the heel bone.